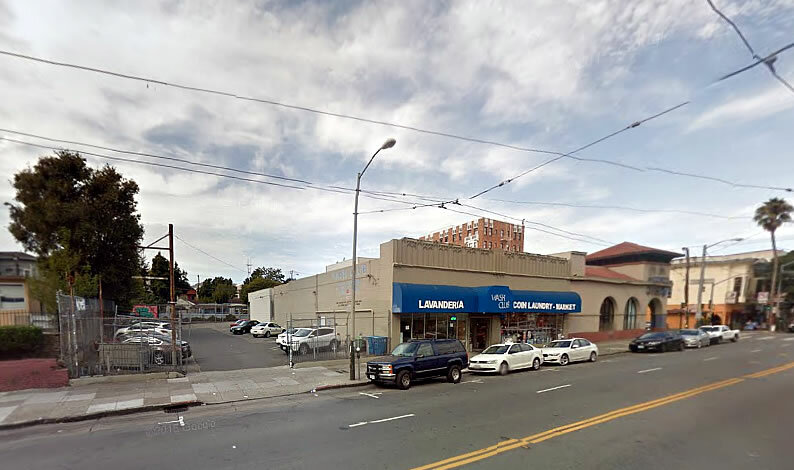 The formal application to raze the Wash Club lavanderia at 2918 Mission Street and redevelop its Mission District parcel and adjacent parking lot has been filed. As expected, while the site is principally zoned for development up to 65 feet in height, and Gould Evans had initially drafted plans for a compliant six-story building with 55 apartments to rise, the project team is planning to invoke California’s Density Bonus law and build up to eight stories upon the site, a plan which would yield 75 apartments, averaging 640 square feet apiece, over 7,000 square feet of ground floor retail space that would be divided into two. While the proposed bonus height plan for the site includes a storage room for 75 bikes, the entrance to which would be by way Osage Street, it doesn’t include a garage for any cars versus 18 spaces as originally proposed. And according to the developer, who owns both the existing laundromat and land, the Wash Club has experienced a 20% decline in revenue over the past 10 years, a trend which is likely driven by the ongoing shift in neighborhood demographics. Great proposal regardless of personal architectural aesthetics. A block away from BART, proper density, no parking. It’s too bad the project doesn’t catch the corner building as well. Uninspiring but highly functional, build it. What is going on with the building next door? That school site looks terrible. Wish this project could hold the corner and included demolishing faux Puebla style retail building. This looks great. Transit oriented, not displacing or taking away from any existing housing stock, tasteful design. I really hope this happens. “A complaint six-story building…” is a prescient misspelling. There are bound to be complaints no matter how much they comply. I am the owner of the coin-operated laundry and parking lot at 25th and Mission. I have been working on the project for 3 1/2 years. I hope to have a Planning Commission hearing sometime late this year, although such timing is highly uncertain. 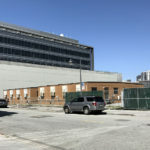 A correction to the article above is that I filed with the Planning Department a State Density Bonus Law plan for the 75 unit building in early April 2016. On March 30, 2017 I filed an update to the previous project plan. The main change is that the plan now includes NO parking so that there will be no traffic on Osage. This change was made in response to feedback from the bordering Zaida T. Rodrigues Early Education School, and in response to a strong suggestion from the Planning Department that parking be eliminated. You can download the condition use application and plans. Please call me (415-332-9242) if you have any questions. I know you have faced “neighborhood” opposition to the point you reportedly offered to sell the property at a community outreach meeting. 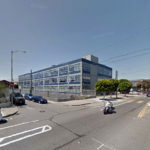 Any softening of their position in the wake of the agreement reached regarding the Miller Electric property development proposal for S Van Ness/26th? Are you within the Calle 24 boundaries? I am a pretty close neighbor (SVN betw 24/25) who supports this project. You should offer up an email address or website so you can accumulate the emails/contact info of neighbors who support the project. Orland, I have stated publicly and frequently over the past two years that I would sell the site to San Francisco AT FAIR MARKET VALUE for 100% affordable housing. I have made that offer personally the Jeff Buckley, Senior Advisor to Mayor Ed Lee on Housing. I have made the same offer to many of the senior Mission activists, such as Erick Arguello, Scott Weaver, Peter Papadopoulos, and Spike Kahn and to Sam Moss of Mission Housing. The problem is that San Francisco simply does not have the funds to buy the property. With the current San Francisco budget crisis likely to grow worse, I do not see that situation changing anytime soon. Mission St. itself, on which my property is located, is (with the exception of where it crosses 24th St.) outside the official Calle 24 Latino Cultural District boundary. That boundary is on the East side of Capp St. So far, I have really had no feedback one way or the other regarding the Miller Electric property development proposal for S Van Ness/26th as it relates to my project. Robert, I just read “The decline of the American laundromat” in the Atlantic. I fully understand your situation, and I understand the position of those who oppose your plan. I am currently trying to launch a startup designed to help people lift themselves to a higher standard of living. I think my plan could benefit the community around your property, including addressing the need for the laundry services you currently provide, in a way that would eliminate the opposition to your building plan. I would love to discuss with you. To be clear, I am a one-man show in early stage concept mode, but with your help, I’m confident we could do great things for the community AND turn everyone into supporters for your project. I hope you can reply and give me a chance to share my idea with you. I’m excited to see this! There could be so much more housing close to the BART station. Love to see this height on Mission. Great! Will there be any “affordable” units in the building? 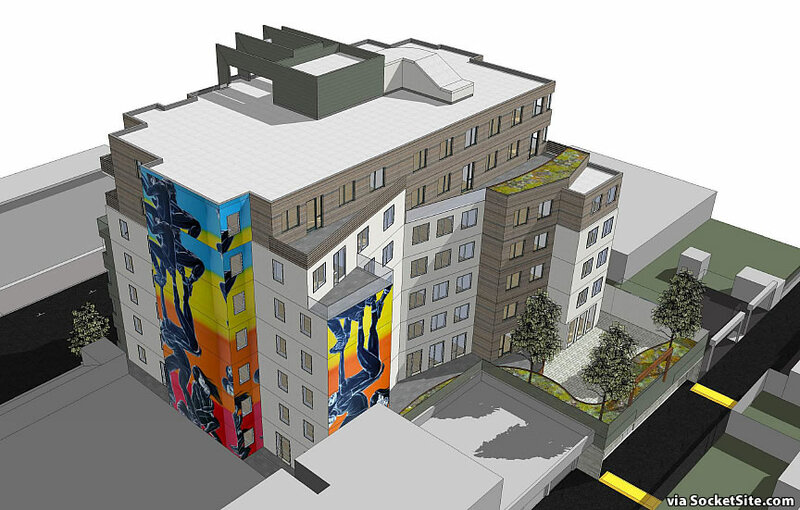 I am the owner of the parking lot and laundromat at 2918 Mission St. For the past four years, I have worked to build at 75-unit rental project on this site. My project will be heard by San Francisco Planning Commission on Thursday, September 14, 2017. You can download from Dropbox complete project plans here. You can review complete project due diligence files here. 1. The site measures 11,653 square feet, consisting of a 6,453 square-foot parking lot and a 5,200 square-foot single-story building used as a laundromat. I have owned the laundromat since 1998 and the property since 2005. 2. The existing building has no historical value per the San Francisco Planning Department’s South Mission Historic Resource Survey Map. 3. The new building height will be 8 floors, containing 6,954 retail square feet on the first floor, and 75 rental units on the top seven floors (18 studios, 27 one-bedrooms, and 30 two-bedrooms). 4. 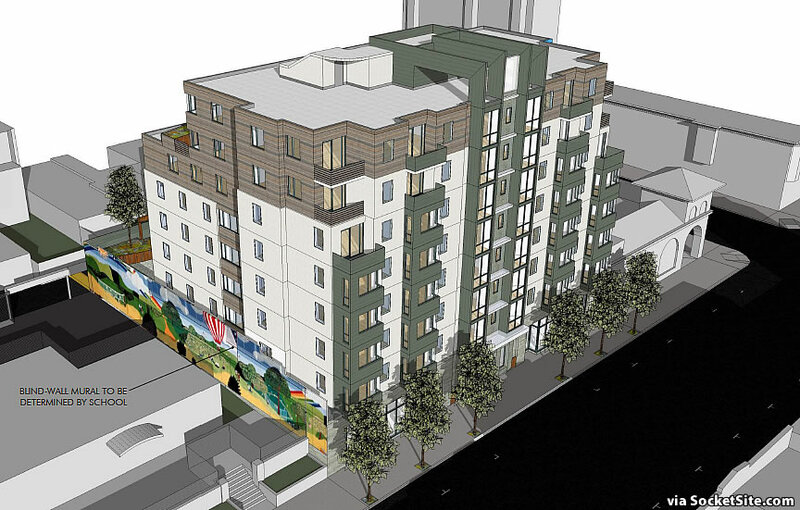 Seven of these rental units will be Very Low Income (50% Area Median Income) and one of these rental units will be Low Income (55% Area Median Income), thus fully complying with both the State Density Bonus Law and with the inclusionary legislation passed by the Francisco Board of Supervisors on July 18, 2017. 5. The units average 360 square feet for studios, 613 square feet for one-bedrooms and 833 square feet for two-bedrooms. This smaller square footage per unit helps make both affordable and market rate rents “affordable by design”. 6. The project design provides for no automobile parking, as requested by the neighboring Zaida T. Rodrigues Early Education School and strongly encouraged by the San Francisco Planning Department. Thus, there is no traffic increase on Osage Alley and, with the removal of the current parking lot, a traffic reduction on Mission Street. The project is one block from the 24th and Mission BART station, on major bus routes, and targeted toward renters who live and work in San Francisco. It has a 99 Walk Score and a 99 Bike Score. 7. The project displaces no existing housing or Production, Distribution or Repair (PDR) space. It displaces no business except my own laundromat. There are numerous other laundromats nearby, including three competitors within 300 feet. 8. I have reached out extensively to the Mission community, including meeting on many occasions with Mission activists, community groups and neighbors, posting my project plans and complete project files on Dropbox for anyone to download, and sending out multiple project updates to the almost 23,000 Nextdoor users in the Mission. 9. I have numerous times both publicly and privately offered to sell the project at fair market value to San Francisco for use as 100% affordable housing. 10. San Francisco is experiencing the worst housing crisis in the United States. This project adds 75 units of new housing on a major transit corridor one block from a BART station without displacing anyone. If new housing cannot be built in San Francisco on such a site, then where can it be built? Thank you in advance for your letter of support to the Planning Department. Please contact me via email or telephone if you have questions. I live at _____________________ and am writing to support building the proposed 75-unit rental project at 2918 Mission St. San Francisco is experiencing the worst housing crisis in the United States. This project adds 75 units of new housing on a major transit corridor one block from a BART station without displacing anyone. If new housing cannot be built in San Francisco on such a site, then where can it be built? Please approve this project as proposed. Further, I urge San Francisco to purchase this project at fair market value for 100% affordable housing, as has been offered by its owner. What’s the fair market value at which the city could purchase your project?